By the time you read this you will have read a ton of verbiage about the February 24 Peter Jennings’s ABC “UFOs: Seeing is Believing.” I think it is appropriate for me to comment since so many people sent me emails about it. Almost all were sympathetic about what they considered the unfair treatment that I and the Roswell incident received. The producers in Roswell interviewed me for over an hour in July, 2004. Don Schmitt who has been active in Roswell research for many years was also interviewed. He and a film crew actually went out to the site, which was marked out for more archeological digging. I believe about 20 seconds of my interview was shown with none of Don’s nor of the scientific work site. I had been cautiously optimistic after hearing a few weeks before the showing that I had made the cut, but that 100 people had not. My optimism decreased when I heard that Seth Shostak, Frank Drake, and Jill Tartar, (SETI Specialists) and Michael Shermer, skeptic, were going to be on. Despite all their writing about SETI, it was clear that none knew anything about UFOs. Proclamation is not the same as investigation. I had jokingly told people that, after all, Peter Jennings and I were both dual citizens of the USA and Canada and, surprisingly, both had been born on July 29. How could I not trust him? I didn’t place enough emphasis on the fact that Benito Mussolini was also born on July 29. I was favorably impressed with the first portion with interviews with aircraft crew members, comments about Blue Book’s focus on explaining away sightings and the interview with Major Friend whom I had met at Blue Book in the early 1960s. The second half of the show was like a horror film. The SETI people waxed poetic about their wonderful search for ET Signals. There was no indication of any knowledge of UFOs other than one of the sillier moments of the show when Jill Tartar described having a sighting of the moon partially obscured by clouds. This was worth recreating?? One can see why the SETI people don’t want to deal with eyewitness testimony. I think one could also see why I say that SETI stands for Silly Effort to Investigate and why I talk of the cult of SETI: Charismatic hand waving, very strong dogma (they must be out there, they can’t be coming here, we will make the most important discovery in Man’s history a signal from a distant civilization, and nobody could possibly come here — if they did, we would be out of a job) and strong irrational claims about the absence of evidence. Meaning “we don’t dare review it.” Dr. Tyson joined the crowd and proclaimed that eyewitness testimony may be OK in court, but not in science. Tell Jane Goodall that. Several times PJ used the term “mainstream science” along with a proclamation about its non-acceptance of UFO reality. No evidence was presented. It appears that the only mainstream science he was talking about was astronomy. Think of chemists, biologists, geologists, us physicists, etc. Much of science today was based on eyewitness testimony of something unusual. Think Roentgen and X-rays. I believe that most mainstream scientists like me believe that the methodology has to suit the problem. Unpredictable, brief appearances of strange craft (not under the control of the observer or of Mother Nature) behaving in strange ways require eyewitness testimony as, of course, do airplane crashes, crimes, etc. Shostak proclaims when he finds a signal they will tell everybody else who will then verify it and anybody can use his own antenna. What happens if the transmission stops? How many can afford their own Hat Creek Telescope System? Does he think the signal will be “Testing 1, 2” repeated over and over again? That we can order the saucer to stop while we do measurements? PJ claimed that mainstream science doesn’t accept the UFO evidence. This was yet another misrepresentation. Polls have consistently shown that the greater the education the more likely to accept UFO reality. Two polls of R and D people showed that about 2/3 of them who expressed an opinion said flying saucers were real. But then they live in the real world unlike the SETI cultists. The program contained, as might be expected, based on past experience, a major putdown on star travel from people who know absolutely nothing about space travel. We were told that the Voyageur spacecraft, our fastest space craft launched 30 years ago, will take 73,000 years to reach the nearest star and that the fastest man made object goes only 11 miles per second compared to the speed of light at 186,000 miles per second. Wow! Sounds like we sure can’t get there from here. These are both totally misleading. The Voyager hasn’t been attached to a propulsion system since it left the vicinity of the earth!! It is coasting. This is like tossing a bottle into the ocean or a feather in the air as a basis for estimating crossing time for the Queen Mary 2 or the SST or the space station. We physicists have accelerated particles in the vacuum chambers of expensive accelerators to speeds of 99.99% of the speed of light. Eleven miles per second is absurd. Space is a very large vacuum chamber. These totally misleading comments rank on a par with Dr. Simon Newcombe’s claim in October, 1903 (2 months before the Wright Brothers' first flight) that the only way man would fly would be with the help of a balloon. Dr. Bickerton in the 1920s proved “scientifically” that it would be impossible to provide enough energy to put anything into orbit. Dr. Campbell in 1941 “scientifically” calculated that the required initial launch weight of a rocket able to get a man to the moon and back would be a million million tons. He was, because of his total ignorance about space flight, off by a factor of 300,000,000. All three were, like the SETI cultists, astronomers. With this track record, why believe any of their proclamations? I was involved more than 40 years ago in work on a fusion propulsion system able to eject particles having 10 million times as much energy per particle as in a chemical rocket. This, of course, was not presented. After all, I was just a promoter. A real hatchet job was done on Budd Hopkins in the show’s segment on UFO abductions. The witnesses were OK, but then we have the off-the-wall proclamations about sleep paralysis being the explanation coupled with hypnosis to generate false testimony from the witnesses. All the data provided by Budd about the fact that many abductions don’t take place in bed (think Betty and Barney Hill, Travis Walton, etc), that there are many cases when more than one person is abducted (is sleep paralysis contagious? ), that at least 30% of abduction investigations do not involve hypnosis, and there are physical markings, was left on the cutting room floor. Budd has worked with over 600 abductees. Had the 2 Harvard psychologists worked with more than a dozen? Why wasn’t any of Harvard psychiatrist John Mack’s interview run? The pronouncement that there is no benefit of hypnosis in memory enhancement is false. Phil Klass made the same claim to me, but stopped when I provided an article about a stonemason being able, under hypnosis, to describe tiny details on a particular stone that he had placed years earlier. Finally we have the Roswell segment. I was introduced as a Roswell promoter. The term was used twice. There was no mention of the fact that I was a nuclear physicist who had worked for the likes of GE, GM, Westinghouse, etc. The totally unjustifiable term “myth” was used at least twice. PJ should be ashamed. Jesse Marcel junior was filmed. There was no mention of the fact that he is a medical doctor, a Flight surgeon Colonel in the reserve, and serving in Iraq despite being 67. His father was called an intelligence officer, but without adding that the group was the most elite military group in the world, the 509th, which had dropped the A-bombs on Japan. Don’t these facts go to credibility? Of course I am a Roswell promoter, based on 27 years of research and investigation and the outlay of thousands of dollars and thousands of hours and finding loads of supporting testimony, visits to 20 Document Archives, all ignored by the noisy negativists and none presented in the program. At the request of the producers I had provided a total of 57 videos from which they used a few clips. One video was the 105-minute “Recollections of Roswell” which included testimony from 27 witness including Retired General Thomas Jefferson DuBose. He told me of taking the call from General Clements McMullen, head of SAC, who was the boss of 8th Air Force Commander Roger Ramey (who was DuBose’s boss) ordering him to get the press off their back, send some wreckage up here today, and never talk about it again. The real promoters on the show were the SETI cultists with their myths. They have no evidence of any kind that there is anybody out there, that there are signals being sent, that they can receive and interpret such signals if there are any, using our primitive technology. An AM radio can’t pick up FM signals. They can’t admit that there is overwhelming evidence of alien visitation. It appears that the producers were perfectly willing to present some interesting testimony though they left out things like Project Blue Book Special Report 14, or other large scale scientific studies, and the statement by AF General Carroll Bolender that reports of UFOs which could effect national security were not part of the Blue Book system. But the three areas of investigation that clearly together establish both the cover-up and that the planet is being visited (Roswell and the abductions and the fact that interstellar travel is feasible with reasonable trip times) were trashed. Sounds like when push came to shove they lacked any courage at all. It was nice to give a neat segment at the end of the program to Dr. Michio Kaku saying that maybe visitors are well ahead of us and can warp space and time. Fusion propulsion systems are much closer in time. Blacked out and whited out government UFO documents force one to the conclusion that the government is not just incompetent with Blue Book, but lying through its teeth. Perhaps I should mention that only 11.6 million people watched the show. The Unsolved Mysteries program on NBC in 1989 about Roswell was seen by over 28 million people the first time around and 30 million the second time. Particularly irritating was the frequent mention of lights in the sky, billions of stars, and absence of physical evidence. There was not even the slightest mention of Ted Phillips’s 3000+ excellent physical trace cases from 90 countries. Why show Chris McKay digging in desert dirt and not the traces left by a UFO? Frankly, I was also bothered by the proclamations by nasty noisy negativist retired USAF officer James McGaha. We had a full-scale debate in Tennessee. The video is noted at my website www.stantonfriedman.com. It is easy to say we need both sides. But is that true when one does his research by investigation and the other does it by proclamation? ver the years I have been involved in the making of a number of documentaries about UFOs. These include “UFOs ARE Real,” “Flying Saucers ARE Real (2 Vols. ),” "Stanton T. Friedman IS Real!,” “Do you Believe in MAJIC?” and in numerous interviews for a wide variety of producers of shows that have aired on the History Channel, The Discovery Channel, TLC, etc. Therefore, I am really puzzled about certain aspects of the Peter Jennings’s Productions UFO special seen on ABC on February 24, 2005. The word is that 150 people were interviewed and only 50 made the cut. That is far more than would be required for a 2-hour special. I had heard just before the broadcast that an interview was done with Harvard psychaitrist Dr. John Mack that would not be used. It surely would have made a good counterweight to the two Harvard psychologists falsely explaining away abductions as sleep paralysis enhanced with hypnosis. It was only after the broadcast that I found out how many extended interviews with very sharp people hadn’t been used. Richard Hall, Dr. Richard Haines, Dr. David Jacobs, Dr. Bernard Haisch, John Schuessler, John Greenewald, Ted Roe of NARCAP, etc. I saw the people who interviewed Don Schmitt (no air time) and myself (20 seconds, and referring to me as a promoter twice, and calling Roswell a myth at least twice) in Roswell with Astronaut Dr. Edgar Mitchell. None of this is in the PJP show. Crews for PJP travelled a lot including, for example, to the MUFON Conference in Denver. There was no mention of MUFON in the program though CUFOS was given a lot of time with old footage of Dr. J. Allan Hynek as well. Strangely he was portrayed as a courageous loner, the only one standing up to the debunkers — a totally misleading portrayal. The question thus arises as to why spend at least many hundreds of thousand dollars to collect far more footage than could possibly be used? Perhaps they will do another special using “the good stuff?” I doubt it. 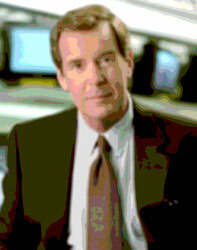 But if one wanted a real state-of-the-art survey of ufology on who knows what, is there a better cover story than that a company linked to Peter Jennings, the last remaining Big Time Network news anchor, is making a hard-hitting 2-hour special? People are flattered to be asked to contribute. Many of us were questioned for more than an hour. It might also be possible when reviewing the tapes to get clues as to who might be speaking out of turn. The crews were very tight about who all they talked to. Is it really surprising that the harshest attacks came down on Roswell, the reality of abductions and the reality of interstellar flight? Glorifying the Silly Effort To Investigate cultists provides a great deal of misdirection away from the reality of UFOs and the government cover-up. The footage would be a feast for the minions of whatever group is taking Majestic 12’s place to help plan their strategy for debunking and also for possible future release of data. I suspect they are also collecting reactions to the program. I would really like to collect the names of those who were interviewed but didn’t make the cut besides those given above.